Hesitation/CEL with JR M45 - Miata Turbo Forum - Boost cars, acquire cats. So I currently have a 97 Miata. Recently installed a JR M45 w/62.5mm Nose Pulley and stock crank pulley. Came with a Power Card and BIPES ACU. Currently when I go into boost I get a bad hesitation. AFR's jump up to 19 to 20:1 w/ lack of power and then it "fixes" it self and AFR's come back down to 11:1 and pulls normal to red line. I got mad in traffic recently and floored it and my CEL came on. P0302 (cylinder #2 misfire.) To which since I had changed a lot of other stuff prior for the smaller pulley (See list below) I replaced the Spark Plug Wires (O-Reilly house brand Omni Spark 7mm) and to no avail. problem still exists. Vehicle currently has NGK Spark Plugs (Heat Range 7 gapped to 0.035"), 305cc Toyota Green Top Injectors (All brand new o-rings), JR Fuel Pump, Omni Spark 7mm Plug Wires. I have checked for vacuum leaks with brake clean and everything seems good. I think its the power card acting up. Unless yall have any idea's? (Probably time for a MegaSquirt)[/QUOTE]"
I've read about this (same problem on a supercharge miata M45 with similar set up) not too long ago but I can't remember where. You seems to have found the problem "the card". Also call Blaine at Moss Miata (805)681-3400 I believe ext 3238, he is the tech support guy for the Moss Miata Supercharger Kit. Is your powercard adjustable? Maybe need to have the car tuned. From what I have gathered, Megasquirt is good is anytime you can afford it coz you may need another $500-$800 on top of the MS price to have it tuned of course depending on who is tuning it. Turbocharging comes with its own requirement. Unfortunately going out of the factory set-up (adding either SC/Turbo) requires $$$$ and time so you can gain knowledge and learn (get your hands dirty) then prolly you can do it your self and save $$. Oh don't forget to learn from other people's mistake. This the other side of the equation of success the normally does not get the attention. This is also mostly the main reason why people abandon their projects as they don't prepare to pay for it. Enough of the old man's wisdom. I have a similar set with yours on a 1994. Let me ask you this what does that "Bipes ACU" do? I don't have that (I can research it but maybe u know) lol. No the Power Card isn't adjustable as far as I know. Bipes basically pulls timing so I can run a higher base timing. Mine is not adjustable either. And I'm having pops on 1st and 2nd once in a while. 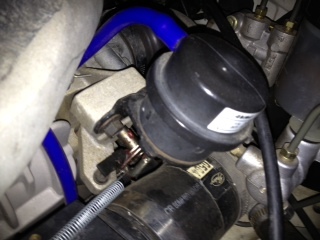 Have you check this part here in the pic if it is working? I believe this gets bad after several thousand miles and is a replaceable part. You can source it thru Track Dog Racing. Call Scott very nice person to talk to. I believe the lever should go up and down to operate properly. Just be patient you'll get it. Our system has been around too long and so people have experience quite a lot of hiccups already. The problem really is as enthusiast we never get satisfied that we keep pushing the max. I mean if you get close to 50% of HP from an add-on, what more can u ask for? Maybe more but then you are going out of the aftermarket manufacturer's coverage. Okay I'm sounding too old again lol. Have u check if the wiring connections on the card to the ECU are intact? Oh contact RedCap he has the same set-up I believe. He is in the know on these things. Cool guy. Buying a Used M45 Kit - Having Hard Time Finding Info!